Just as the free agency period opened, the BC Lions announced contract extensions for star linebackers Solomon Elimimian and Adam Bighill. With the new deals both Elimimian and Bighill are tied to the club through the 2017 season. 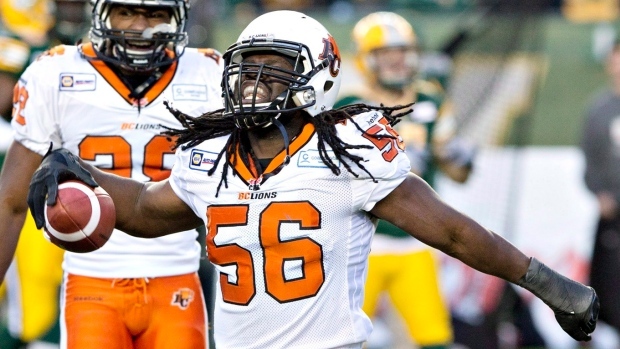 TSN's Farhan Lalji reports Elimimian's deal is for $700,000 over the three years. There was some speculation the All-Star may become a free agent on Tuesday because he signed a one-year contract last season. However, he signed two one-year deals, the second of which the team could register with the league at any time. Last season, the Hawaii product picked up 143 tackles, five quarterback sacks, and an interception on way to winning the Most Outstanding Player award. Elimimian, who has 403 tackles, 17 sacks, and six interceptions in his five years with the Lions, was also named Most Outstanding Defensive Player in 2014. The 26-year-old Bighill had 77 tackles, six sacks, and one interception last year. The Lions also agreed to terms on a contract with free agent defensive back Chris Rwabukamba.